This day, December 30, was once the birthday of someone I cared about. Every time this day rolls around, I remember and miss her, even though more than 30 years have gone by. I wish I could pick up the phone and tell her Happy Birthday. I don’t think you ever stop missing the loved ones who leave you. Today my husband didn’t have to go strip or wax floors all day, so we slept in a little. He still had to go out and run some errands, including getting a new doorknob for the boys’ bathroom, because it had reached the point where you could get out, but you couldn’t get in! I sat down to test Mary’s sewing machine. Mary originally bought a sewing machine with her own money, which was eventually given away to someone else who needed a machine, so I gave her my old machine which was a perfectly good machine–it had just been replaced with a somewhat fancier one. A few weeks ago Mary tried to use the machine to sew something, and after hours of trying, she gave up in frustration because she couldn’t get the machine to work. So I told her to bring it here for me to look at. Before even turning it on I made sure it was clean and lint-free. The thread spool spindles were inexplicably missing so I had to improvise with a knitting needle. I threaded it carefully. I tried to sew a sample seam. The motor hummed along beautifully. The needle bobbed happily up and down. It just didn’t sew anything. Now I know that it is probably a timing issue and that this machine could be fixed. The question is, is it worth $80-$100 to fix a 20-year-old machine? Especially when I have a “spare” machine that works just fine? I’m thinking no. So she will go home with a working machine and I can still decide at some point in the future to fix the old machine if I really want to. I did have some errands of my own to run; Mary and Mercy did a photo shoot; Mary and Jordan got to talk to Lina on the phone; and I made a big pan of lasagna followed by rhubarb-raspberry crisp which was a real treat. I also had a huge reality check when I sat down to plan the spring semester and realized that I have to start teaching again next week. Oy! The rest of this week suddenly got a LOT busier! Although it doesn’t sound like I did much, and I didn’t, it was more than I have been able to do lately. My sinuses were a little less congested today and that means I was a little more functional. Here’s to more improvement tomorrow! The hymn I would like to feature today is “Great is Thy Faithfulness,” but I can’t because I have been told by multiple sources that Hope Publishing, which owns the copyright, defends it with fierce and unforgiving vigor. So, if you know it, please sing it on your own or listen to the link below. This morning I took Lucy to the church where she goes to youth group, because we were in desperate need of getting her release form notarized so that she could go on the winter retreat which started this afternoon. This church, which is also my friend Robin’s church, is a medium-sized Baptist church with a beautiful old-fashioned design. I wasn’t that thrilled about being there, because of the fact that I am still sick, but I changed my mind when the second hymn we sang was “Great is Thy Faithfulness.” Oh, what a blessing to be able to sing along with at least a couple hundred other voices! Since I know the words by heart, I sang with my eyes closed and let the tears just slide out from under my eyelids from time to time. This hymn and I go way back. I have loved it since childhood and it has sustained me through some dark days. One of my favorite memories involving this hymn was something that happened in 2000. I was in Zambia, at Sakeji’s 75th anniversary reunion. The reunion officially ended on Saturday, but on Sunday there were still quite a few of us there, and we had a church service in the main sitting room. Anyone could request a hymn, and considering the occasion I felt it would be very appropriate to sing “Great is Thy Faithfulness,” even though I knew I would probably cry while singing it, because I always do. So I requested it, and we started singing it, and there was a lady who began weeping until she was sobbing very audibly all through the singing of the hymn. This lady was the mother of some siblings that I had gone to school with, and at the end of the hymn, her husband asked permission to explain the reason for her tears. They had struggled greatly with sending their kids to boarding school. When they took their two oldest to Sakeji for the first time, it was gut-wrenching to drive away and leave them behind. To distract themselves, they suggested to their youngest, who was still a preschooler, that they might sing some hymns as they drove along. “Great is Thy Faithfulness” was the hymn he requested, and they clung to that hymn and to the God who is always faithful all the way through their kids’ education. In fact it was the hymn chosen by their youngest son’s class to sing at their high school graduation many years later. So you can imagine what an impact it had on them that day, with all their kids grown and walking with the Lord, as we celebrated the Lord’s faithfulness to the school as well as to each of us individually. Well, today was not a productive day at all, unless I just say my goal was to try and recover as much as possible from this horrendous sinus infection. I made it through Walmart this morning, but after Mary and Jordan left for Dallas to see Flynn, and Walter, Mercy and Spencer left for work, I had to lie down. After lunch, I dragged myself out the door again to get some stuff at the drugstore before going to the library where one of my writer friends was having a book signing. I am looking forward to reading the book and when I do I’ll tell you about it. The author’s name is Lana Lynne Higginbotham. I had another brief rest before heading up to the north side of town with most of the family to attend the high school graduation of Spencer’s friend Philip. Philip’s family have been our neighbors for decades. Both of Philip’s parents went to college with Walter and me, in fact, so we have known them over 30 years. Each of the three children in the family have been very close friends with one of my kids throughout childhood. The oldest son Jacob was Flynn’s best childhood friend, and the daughter Raquel and our Mary were inseparable for years. Philip and Spencer have been friends since babyhood. So it was very satisfying to see Philip graduate and be launched into his future. We got to see a few old friends at the ceremony as well. By the time we got home and got around to having supper, Mary and Jordan had returned after a pleasant day spent with Flynn and another friend of theirs. Now I’m looking forward to taking some more meds and trying to get some sleep. Envy. I’ll be honest here. I’ve struggled with envy my entire life. I’m envious of people who are attractive and vivacious. I’m envious of people who are perpetually thin without trying. I’m envious of people who can dream up a project or an adventure knowing that they can afford to fund it. I’m envious of people who understand math. I’m envious of almost anyone who lives in my special part of Africa. But right now, this minute, the people I envy most are those who don’t have chronic sinusitis that bursts forth into a hellish acute version every single time some other aspect of their health is compromised. Grrr! After months of comparative health, I am now experiencing my second acute sinus infection in one month. This makes it very hard for me to carry out all the plans I had for this week–or even a few of them. I am doing all the home remedies I know, except for the garlic soup which I hope to try tomorrow. My garlic tolerance is pretty low, so we’ll see if I can even swallow that stuff. I know what you’re thinking. Why don’t I just go to a doctor? Well, because we don’t do that anymore. Ever. I’m sure if someone broke a limb or had a stroke we would go, but not for stuff like this. We don’t have insurance and we don’t have the income to spend on health care and it’s been this way for long enough that the other day when someone was telling me about taking their kid to the doctor for what I consider a run-of-the-mill type illness, I was very taken aback. We just don’t ever think of going to the doctor because we know we can’t. And now, we have to figure out how to save up to pay the fine for not getting Obamacare, because although the fine is outrageous, it’s a whole lot more affordable than Obamacare itself. Okay. I’m done whining and ranting. Today was kind of a slow day due to the fact that I was not feeling at all well. The work crew left late because Walter had to work so late last night. I eventually made it up to the fabric store where I got some fabric on sale and stocked up on some cheap patterns. By the time I got home, I just wanted to lie down. So I did. Mary was a huge help today. She made some gluten-free pie crust so that I could make pecan pie for dessert. She assembled our famous Sombrero Dip so that we could have one of our favorite suppers. Lucy, meanwhile, after trying and failing last night to dye her hair with food coloring, went out and bought Koolaid today. Eventually she had some rather vivid orangey-red locks to show off. Immediately after eating supper, Mary, Jordan, Mercy and Lucy all went to meet up with some friends to watch a movie. I’m sure they had a good time! Jasper was a little upset about not getting to go with them, so he and I watched a movie at home that neither of us had seen before. We have a “new” TV that is Flynn’s “old” TV so our video-watching experience has been enhanced. The other main event of today involved our cats. This morning, while I was making breakfast, Walter went to the laundry room to get something. (The laundry room is where the cats spend the night.) The cats all rushed toward him and then were suddenly possessed by some form of instant insanity which caused them all to turn on each other and try to kill each other. My poor husband, who doesn’t even like cats at all, tried desperately to separate them. All I heard from the kitchen was a lot of yowling, growling, and yelling! It took several hours for them to settle down. Eppie and Mal-Mal were very grumpy and aggressive, and poor Neko was terrified that he’d be attacked again. We have no idea what caused the incident, but by this afternoon they were all sleeping happily together in the laundry bin. Whew! It’s been a quiet Boxing Day here at our house. Walter, Spencer and Mercy left at 8:00 to go working on the floor contracts that Walter gets every year. My considerate husband didn’t even attempt to get me up. I slept most of the morning away, a very novel experience for me, but in this instance very necessary too. When I did finally stagger out of my bedroom in search of caffeine, I found a very bored Jasper in the living room waiting for someone to get up! Lucy slept even later than I did . . .
Jasper helped me do some dishes and I did a few other things before heading to Walmart to pick up a few things before Mary and Jordan arrived. They left Chattanooga early this morning and got here late this afternoon. It is so good to have them back with us for a few days! Visits from my grown kids always seem too short. Mary helped with getting our Boxing Day dinner ready–leftovers with some new “supplements.” There were eight of us around the candlelit dinner table. After supper, we had a second Christmas, with Mary and Jordan opening their gifts from us and the rest of us opening our gifts from them! It was a joyous time as all the gifts reflected the thoughtfulness of the givers. The funniest moment was when Mary and Lucy found out that Mary had given Lucy the same identical “Dr. Who” socks that Lucy had helped Spencer pick out for Mary! Walter still had to go back to work, and most of the family went to be early. Mercy is still struggling with jet lag and Mary and Jordan were tired after their trip. Come to think of it, I’m pretty ready for bed myself . . . Despite the fact that I was essentially brain dead yesterday, it was a lovely day. After my all-nighter, I had a shower, made our traditional Christmas breakfast (without the hot cross buns, sadly), and got the others up (except for Mercy, who was up early thanks to jet lag). Our tradition is to open our stockings while the breakfast casserole is in the oven. There are always some amusing gag gifts in the stockings, along with plenty of candy. 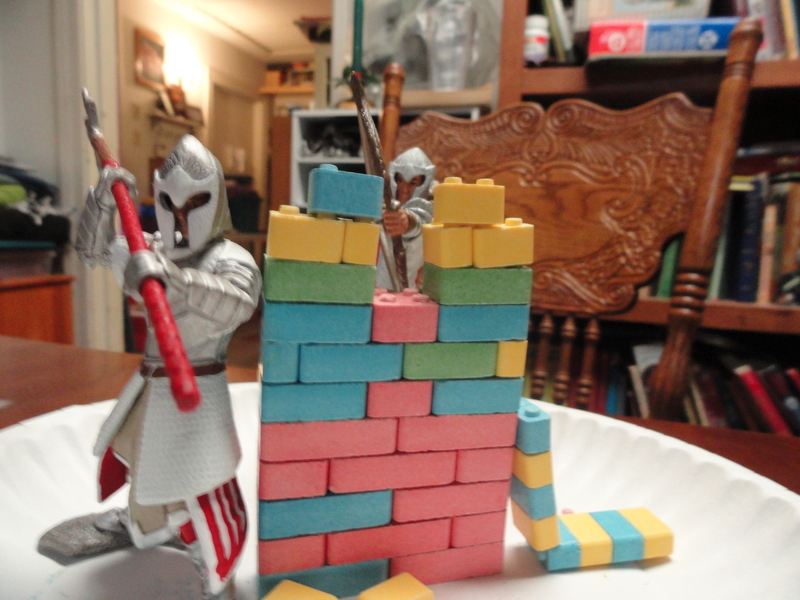 This year we had some special candy which was a gift from a former neighbor: edible Lego. I thought it was just Lego-shaped, but the kids soon discovered that you can actually build with it. After our delicious breakfast, we returned to the living room to open gifts. It did not take as long as usual this year because there were only 7 of us. I bet you want to know what I stayed up all night sewing, don’t you? 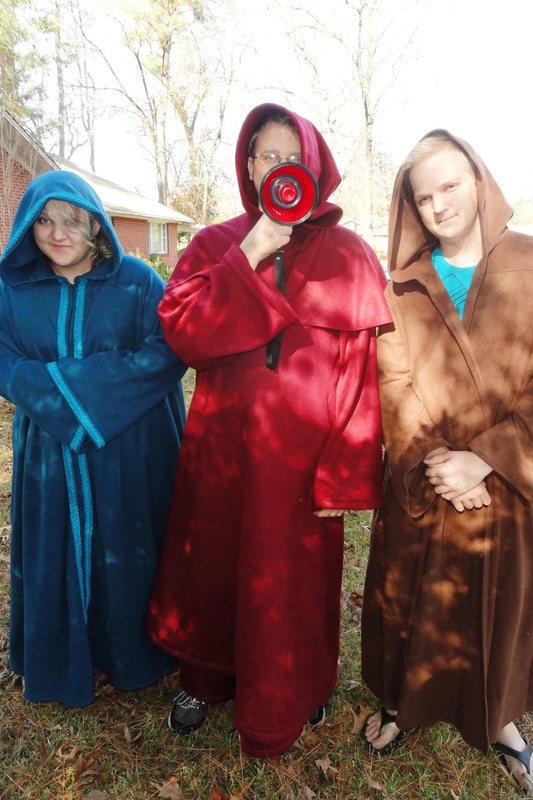 Well, remember when I made Spencer that jedi robe for Halloween? I made it out of fleece so it could double as a dressing gown. Then I started thinking that Flynn’s dressing gown was pretty skimpy due to his height. It barely reached his knees. Then I thought about the fact that Lucy did not have a dressing gown at all. So I decided to make them each a floor-length dressing gown. This was a big decision because I really hate sewing bulky things, and a full-length garment of fleece is extremely bulky. By Christmas Eve, Lucy’s was almost done but Flynn’s had only been cut out. I hadn’t sewed a single stitch. I finished Lucy’s gown well after midnight and started Flynn’s at 2:00 a.m. I sewed through the dark cold night, and at 7:45 in the morning, when the sun had risen to reveal the frosty field behind our house, I finished. Whew! And yes, they were gratefully received! Flynn is holding his megaphone, which was a gift from Jasper. It got quite a bit of use yesterday! I did not receive any “big” gifts, but I got many lovely things, including some souvenirs from Korea, a lovely blue teapot, and a magnetic knife rack. The knife rack was my gift from Spencer and was such a huge surprise. I have wanted one for years but I don’t think I’ve ever said so. So for him to think of getting that for me is amazing. It has a very powerful magnet and should hold even my largest knives. We don’t eat lunch on Christmas Day. After our big brunch, we snack if we get peckish. So my plan was to take a short nap and then call Lina at our usual time of 2:00. I lay down at about 1:15 and thirty seconds later my brother Jon called from California. By the time we hung up, I had a scant 15 minutes to sleep before calling Lina! I got up at the appointed time and was getting the number to call Lina, only to have the phone ring again. This time it was my brother Greg calling from Ohio. I talk to him so rarely that I didn’t want to cut our conversation short, so poor Lina had to wait another 40 minutes. The phone got passed from person to person so Lina could talk to everyone while I got busy making pies. In my weakened condition, two pies seemed quite adequate for Christmas dinner. Eventually I did get a chance to talk to Lina for a few minutes! I thought they were very pretty and the colors are good for her. We had a fun time around the supper table as always. When we are together as a family, there is always so much laughter and that is something I love. After supper we called and talked to Mary, who is arriving today, and then we had to say goodbye to Flynn. He had to drive home last night so he could be at work today. I also got a phone call from my brother Matt in Indiana and called my parents in Tennessee! So despite my exhaustion, it was a day full of love and family. And yes, that 15 minute nap was the only one I got. I did not stay up late. I did, however, sleep in shamefully late this morning! Well, a nap is what I want most right now, anyway. I had a gift to finish last night, and I couldn’t get out of it, because I didn’t have a backup gift, and I have already been there and done that. The cold house and the caffeinated drink mix helped me stay awake and keep working through the night. I’m pretty tired now, however, and am hoping that various offspring will be able to do at least some of the cooking today! May you all have a Christmas blessed by loving friends and family, and may we all thank God for the priceless gift of His son. It is very unusual for me to skip two days in a row. I didn’t even post my hymn yesterday for the fourth Sunday of advent! In my defense, I’m trying to fit in a couple of weeks’ worth of work into three or four days. Today was a complete loss in terms of getting stuff done, because we went to Dallas. Mercy flew into Dallas last night instead of this evening so Flynn went to meet her at the airport in the middle of the night and she spent the night in his apartment. We got up and finished getting Mercy’s room ready before heading to the far side of Dallas where there is a pretty well-stocked German grocery store. Walter had been given a couple of gift cards and he wanted to spend them on German Christmas goodies. It was quite a hard decision because there were so many yummy imported things there! While Walter and the kids were salivating over the lebkuchen and marzipan, I went next door to explore the health food store, in hopes of finding a few gluten free items that I have been looking for. For the first time ever, I found gluten free lasagna noodles in the brand that I like. (I could get them from Amazon but I’d have to buy a whole case.) Even more exciting, I found gluten free ladyfingers! This means I can now make gluten free tiramisu when Mary is here. They also had gluten free angel food cake mix. I was a happy customer! After loading up on German goodies, we headed for Flynn’s apartment, where we were reunited with Mercy at last! (And we all kind of gasped when a Lamborghini passed us on the highway!) Then we all went out for a very late lunch. Flynn had to go back to his place to pack, but the rest of us continued on to a nearby Walmart where I was able to pick up some flowers to take to my Aunt Marcia. You may remember that my Uncle Ron died in October. Aunt Marcia was unable to stay on her own as she has Alzheimer’s, so she is now in a care facility in the Dallas area. We are the closest family members to her, and I have been wanting to get over there to visit her. Our visit was a complete surprise! Because of her Alzheimer’s, I wasn’t even sure she’d know who I am, but she did know and she introduced me and my family to her roommate. We had a nice visit for about an hour. I like to think that we succeeded in brightening her day. She really did seem very glad to see us, and I was glad to see her! After that it was the long drive home. Flynn has since arrived and is entertaining us with an interactive article of clothing. And Mercy is home at last! 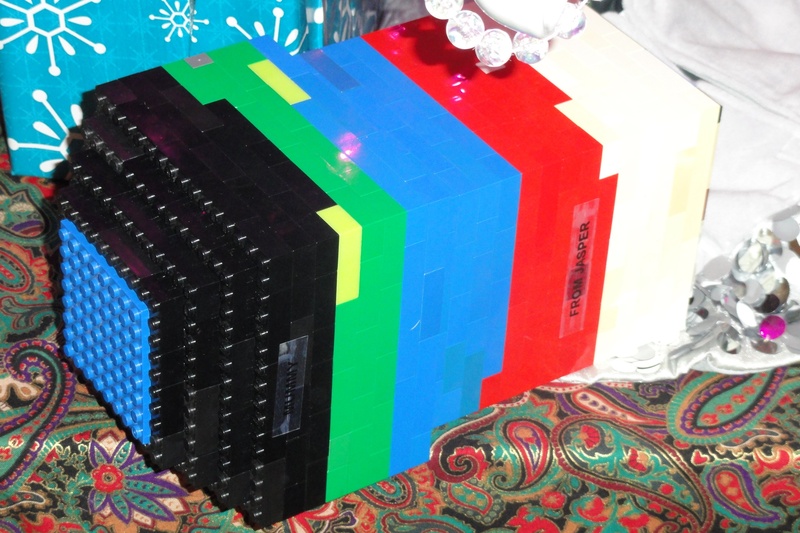 Jasper wrapped my gift in Lego! I had been looking forward to today all week. Today was the day I was going to get together with a friend and have a pleasant little interlude. We were supposed to meet at Books-a-Million at 1:00 p.m. I was there at the appointed time. I got myself a mango smoothie and sat down to wait. I did some knitting. 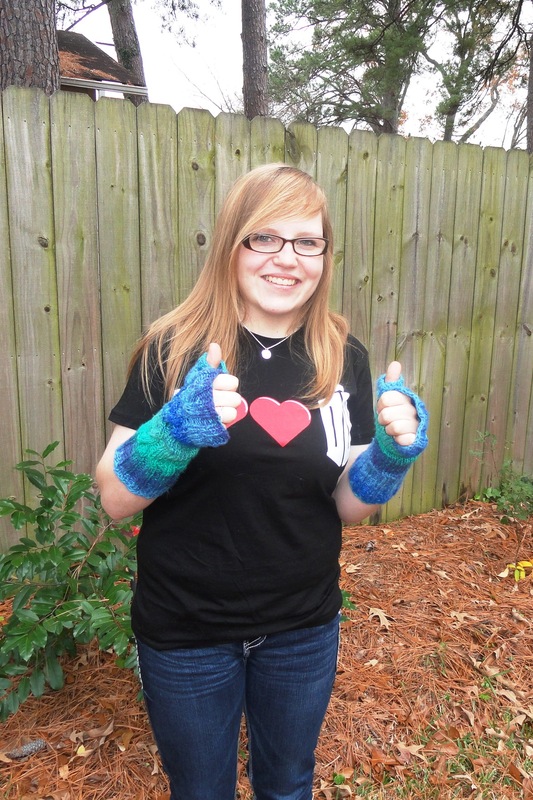 I knitted some more. I began to suspect that my friend had forgotten, but unfortunately I did not have her cell phone number. After a full hour had gone by, I realized that she was just not going to show up, and I had plenty of stuff to do at home. So, I reluctantly left. I was disappointed, obviously, but it had actually been kind of nice to just sit there and knit for an hour. I hope I can reschedule with my friend soon, though! After I returned home, I got a phone call from Lina. She was having trouble with a serger she had borrowed and unfortunately I don’t know enough about the inner workings of sergers to be of any help to her! Sewing has been going on. Not well, mind you, but I have been doing it. You know how sometimes you can hear a song, and it just takes you back to a specific time and place? Maybe even a specific scene in a movie? We all have those music memories, I think. Songs that instantly evoke an event or a time in your life. A few notes play, and your mind effortlessly steps from now to then. Take, for instance, my friend Gwen. Gwen and I have been friends since we were eight years old. When we were eight, she had a little ukulele and she could play anything on it. 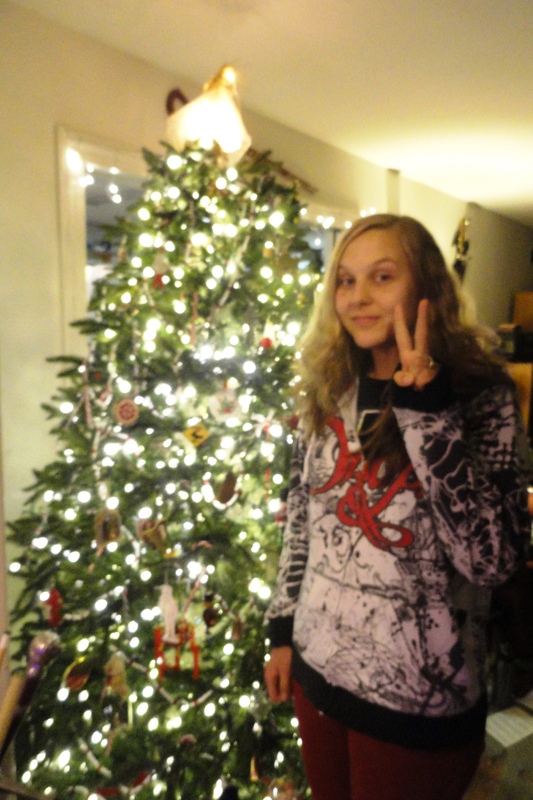 When she was nine or ten, she got her first guitar. Gwennie’s tiny fingers could hardly reach across the frets to finger the chords, and her right arm had to really stretch to reach down over the guitar to strum the strings. The guitar might have been bigger than she was, but she soon mastered it. I think her mother might have helped her get started, but she mostly taught herself from a book of chords. When we were eleven, both our families were on furlough in the US, and Gwen’s parents sent her to guitar lessons with a classical guitarist. After a few months he was forced to tell them that she had surpassed him. Now she could play anything either by strumming or picking. I say all this to make the point that Gwen’s guitar playing was a huge part of my growing-up years from when I was eight until I was seventeen. She had a core repertoire of songs that she enjoyed playing and singing, and I memorized them all. When I first went to high school in Kenya, Gwen would come to my room to practice in the afternoons because her roommate didn’t like to hear her play (!!!). She would perch on my bed and play those same songs that I had come to love. She would also take requests. Over the years since high school, my memory has, uh, faded a little and I no longer remember all the words to the songs that I once loved. I try to sing them in my head but there are gaps! (In the words–not the tunes.) Gwen has forgotten a lot of them too, and she no longer has the music. I have tried repeatedly to find at least the words online, but never had success. All I knew is that several of my favorites were written by a nun. Yeah, that’s real specific. And yes, I might have already ordered that one album. To you, it will probably just be a simple little song. To me, it’s years of my life. The first few chords of the introduction take me back to when I was 16 even before any words are sung . . .
Gwen still plays her guitar and sings when she comes to visit me, by the way.